Choose 1 nitrogen source, I phosphorus source, and 1 potassium source from the materials listed above, For example, you could select blood meal for nitrogen, rock phosphate lor phosphorus, and greensand for potassium. Mix the 3 materials you've chosen in the proper proportions. Be sure to wear a dust mask, gloves, and safety goggles while mixing the ingredients. Kelp meal is the single product that Bill Wolf uses most to fertilize plants because it is such a complete source of the minerals that plants need. He advises applying 10 pounds of kelp per 1,000 square feet for fruit crops, vegetables, lawns, or ornamentals. Adding 1 teaspoon of kelp meal to the potting soil in a 6-inch pot will keep container plants looking their best. 3. 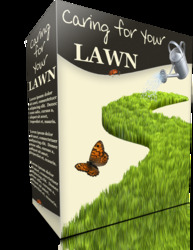 Apply the custom fertilizer around the base of established perennials, fruit trees, or roses. You can also mix some of the fertilizer into the soil of a bed before planting vegetable or flower transplants.